Apple CEO Tim Cook spoke at the annual Goldman Sachs Technology and Internet Conference today, where he covered a range of topics from Apple's dedication to the environment, the major products the company launched in 2014, and his thoughts on the Apple Watch. When asked by Goldman Sachs COO Gary Cohn what makes the Apple Watch different from other smart watches on the market, Cook recalled the MP3 industry. I see the smart watch category very much like that. There are several things that are called smart watches, but I'm not sure you could name any. There hasn't been one that changed the way people live their lives. At Apple, that's our objective. We want to change the way you live your life. Cook went on to say that he believes the Apple Watch will do just that, impact people's lives in a meaningful way. He says that one of the major surprises will be the breadth of what the Apple Watch can do, and he expects that everyone will find something in the Apple Watch that they can't live without. Cook highlighted the many design options for the Apple Watch, its "fantastic" look, and the innovative ways of communication that it will enable. Cook says that he "constantly" uses Siri on his Apple Watch, and that he uses it when working out to measure activity. He also pointed out the feature that pings people when they've been sitting for too long, which he sees in use on a daily basis at Apple. During meetings, he says, towards the end of the hour, people will begin standing up as their Apple Watch alerts them to do so. "A lot of doctors believe sitting is the new cancer," he said. "Arguably, activity is good for all of us." 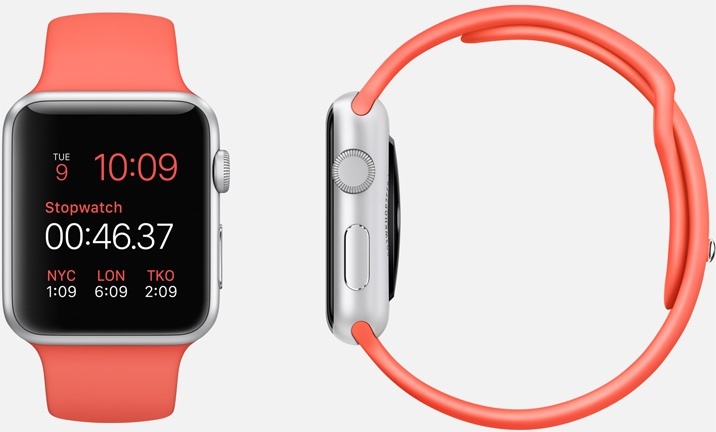 Cook says that he is "super excited" about third-party apps that are being developed for the Apple Watch. I think everyone's going to have their favorite thing, just like when the App Store came out. Remember the saying 'there's an app for that? There's an enormous number of things it will do. Earlier this month, Tim Cook confirmed that the Apple Watch is still on track to launch in early 2015, with shipments that will begin in the month of April. Pricing will start at $349 for the lower-end version of the device. Nice novelty for people who have the definition of disposable/unwanted income, but this isn't the "iPod" of today. People (myself among them) gladly paid $399 for an MP3 player in 2001. Why wouldn't they spend less than that for something that does a lot more today? I guess my life is over since I won't own one. This smart watch trend is BS! Change the way people live their lives at $349 STARTING price? That's a good top of the line price, but starting price, entry level? Not on your rich life sir. Nah, it's not going to change anything for me. It's not that much effort to pull my phone out of my pocket if I need to do "smart" tasks. I mean, this is at the end of the day, an accessory to the iPhone. It can't stand alone even. Not only that, if it requires bluetooth connectivity or anything like that, it will be an accessory that just depletes the battery faster. And I'm not even about to try typing on my wrist, or reading extensive work emails on it. Nice novelty for people who have the definition of disposable/unwanted income, but this isn't the "iPod" of today. At best this is the iPod Hi-Fi of today. Edit: And "Can't live without"? That's a bit strong. I mean, I love my iPhone 6 Plus. Thoroughly enjoy it, as well as my iPad Mini 3 and my MacBook Pro, and all my past Apple devices. But I could certainly live without it. And it's far more useful than the watch will be. Hyping something too much can actually be damaging too. It builds excitement in ignorant folks who will be let down when they realize it's not only something they could live without, but also something that adds little if anything to the Apple experience they already had. I really hope they still have some surprises up their sleeves. The use cases he mentioned aren't novel at all. Imagine knowing that every word you utter is being evaluated by 10,000 people with their cursor drifting between the "buy" and "sell" buttons on their Apple stock. Everything always has to be "the best of all possible worlds" or the stock could start an avalanche. Poor Tim. I thought iPad was a dumb idea, now I can't imagine not having one. The watch sounds extra dumb but we'll just have to see. With comments like this it's difficult to know who is more guilty of pure, unmitigated hyperbole: you or Tim Cook. I don't actually believe that $349 is a big ask for this device. People routinely pay thousands of dollars for watches that do nothing but tell time, and not even that accurately. Even fashion watches routinely cost hundreds of dollars. This is basically a computer with retina display on your wrist, so the fact it is only $349 is amazing. I'll be happy to pay more for the stainless steel model.